This simple crepe wedding dress with cutouts from Essense of Australia V-neckline, highlighted on either side with sheer, lace straps. Ivory lace in the bodice of this gown, and continues slightly through the hip. A V-back highlights the back of this gown, and is accented with sheer, lace detailing and pearl beadwork. Has a modest train, and is finished with lace detailing. Buttons all the way down the back. 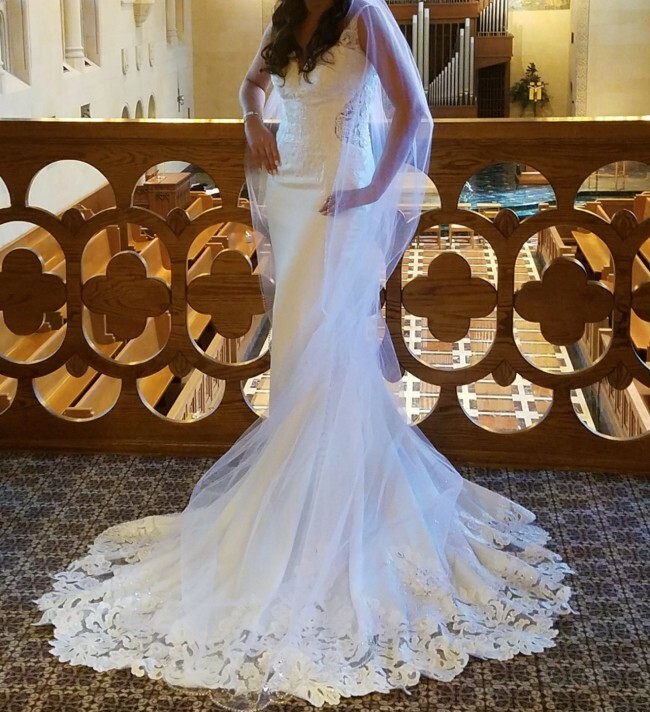 The dress is beyond words, I felt so amazing in it and I hope someone else can have that opportunity! The only alteration was to hem it for a 5"5" with 3" heels. Hemed at bottom to fit 5'5" with 3" heels. No other alterations done!